1.Product Details TAVR computer monitor riser allows you to raise your monitor up for more comfortable, ergonomic viewing and to maximize desk space. TAVR monitor riser comes in a classic black. ▶ New user friendly - Simple assembly . it takes less than 10 minutes to install. This simple TV stand is easy to install and safe to use. ▶ Please note ：Customer service response in 24 working hours. ▶GOOD QUALITY MARERIAL-12mm matte black MDF panel measures 16.7"x 9.4" with high quality blister finishing,Maximum weight capacity of 33 lbs. ▶UNIQUE DESIGN-Round Corner safe design to protect user.The side plate protruding prevents the item from slipping off. 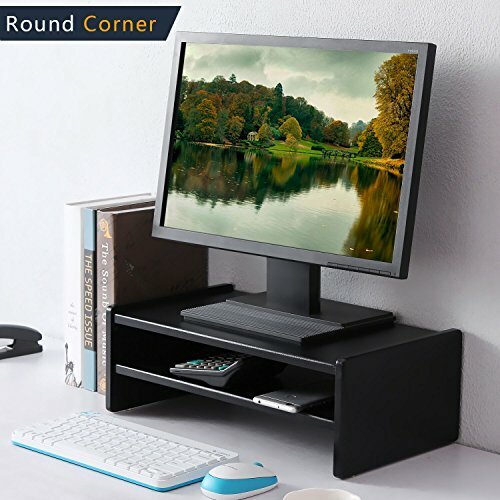 ▶SLIM AND MODERN DESIGN-Slim and modern design enhances the visual organization of any desk.The computer monitor riser makes the perfect flat surface for LCD monitors, TV's, audio equipment, printers, streaming devices, and other desired items. ▶EASY ASSEMBLE-Easy to assemble and ready for use in minutes. ▶ERGONOMICS HEALTHY DESIGN-Raising your monitor to a proper ergonomic viewing position creates better posture which can help reduce neck and back strain computer users get from sitting at a desk for long hours. If you have any questions about this product by TAVR Furniture, contact us by completing and submitting the form below. If you are looking for a specif part number, please include it with your message.